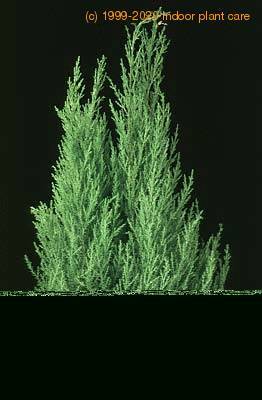 Use Flower Servant and it will remind you when to water, mist, fertilize or repot Cupressus macrocarpa. Click here and try for free! It is a quick growing, triangular shaped plant. 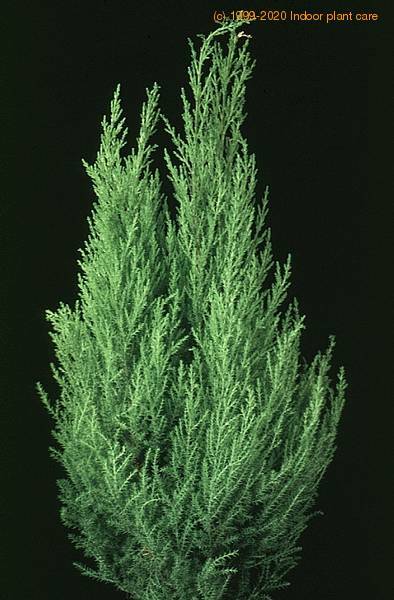 The leaves are blunt, scalelike, bright green colore and usually without gland-dot. The barkis is gray, rough and fibrous. Cupressaceae seeds are almost round cones, slightly longer than broad, brown colur, with 8-12 rounded, pointed and hard scales tightly fit together. Cupressus macrocarpa is an excellent container plant as well as an individual specimen for the garden. Will even succeed indoors as a pot plant, provided it receives sufficient bright light. The soil should be well drained and reasonably fertile - add plenty of slightly acid compost to sandy or clay soils to improve their texture. Will thrive in an open, sunny to lightly shaded position. The golden varieties need full sun to show their best colours, but the blues and the silvers are often better in semi-shade, particularly in the hotter areas. Keep well watered during dry spells, especially in summer. Little pruning is necessary. Propagate by means of tip cuttings 5-7.5 centimetres long (2-3 inches) taken during mid to late winter. Root best in sharp sand, under mist with bottom heat if possible.